This new web CMMS software add-on is a simple and intuitive. Access your CMMS from anywhere at anytime! 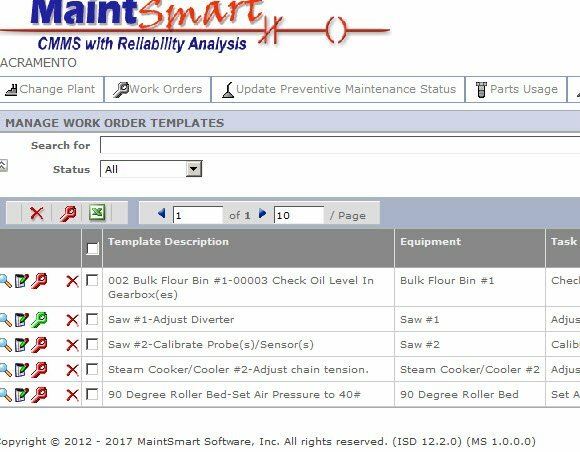 The new MaintSmart Web Work Requester version 5.0 (web CMMS software system) makes it simple to submit repair tickets and manage work with a tablet computer, or other portable device. This redesigned web-based equipment maintenance management software links to the same database as the main enterprise program uses. Most of the common functions found in the main enterprise software system are now available in this web version. Below is a listing of the capabilities and how this economical web CMMS software (preventive maintenance software) module benefits your organization. SEE THE INSTRUCTIONS BELOW ON HOW TO TEST DRIVE THE MAINTSMART WEB 5.0 PROGRAM. What if you receive a "Secured Connection Failed" message or other message that prevents access to this test site? Contact us to guide you in setting up correct permissions on your browser. Call or email for MaintSmart Cloud instructions. Close completed preventive maintenance (PM) tasks from your tablet computer as work is completed. 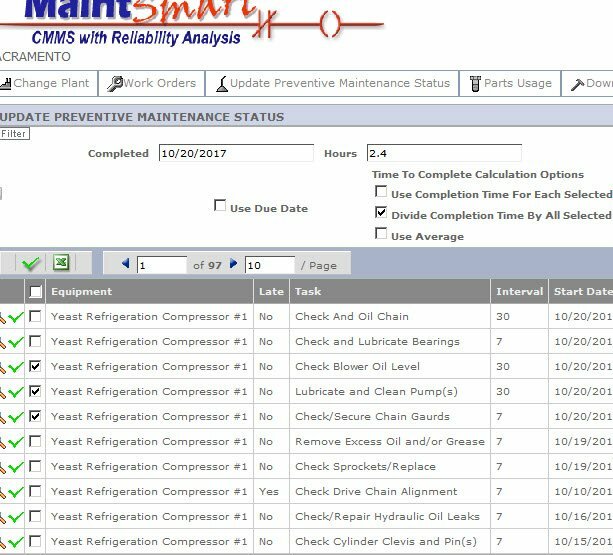 Preventive maintenance tasks are automatically recorded, recycled and ready for the next PM cycle with one button-click. Link spares to PMs. These spares are automatically used from stock when the PM is closed. Close multiple preventive maintenance tasks at once. Generate repair tickets and full work orders through this web-based CMMS while in the field or on the plant floor. There is no need to return to you office computer to manage work orders or repair tickets (work requests). Making it simple for non-maintenance personnel to notify maintenance benefits everyone in your organization. Equipment failure in the plant or in the field? Simply enter the downtime information into a portable device on scene. This information is immediately available in the full enterprise downtime software system and the cloud software system (if applicable). Encouraging downtime logging provides data that is used by the CMMS to improve equipment reliability. 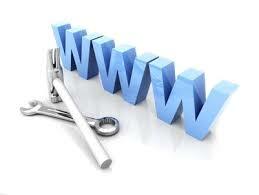 Web-Based Preventive Maintenance. Close many PMs all at once. Parts linked to these PMs are automatically used. 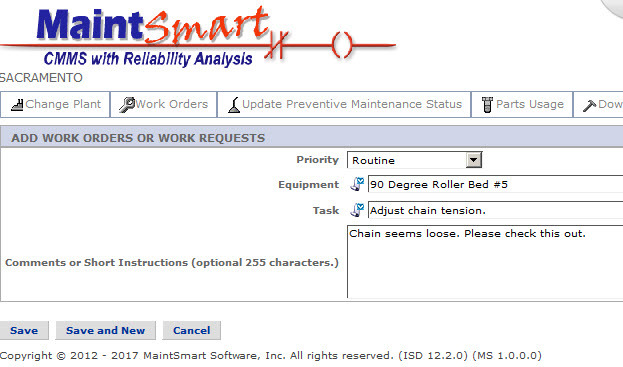 The new web-based CMMS module also provides a way to generate new work orders with one button click. Using existing or new work order templates provides speed and consistency to your work order management program. Use spares against work orders, PMs, downtime or simply link the usage to an equipment item. This immediately updates stock levels. Deleting a parts usage record automatically adds the part back to the main inventory store. Why Use a Web Work Order System? Web-based work order software systems have the advantage of accessibility from virtually anywhere a web connection exists. many maintenance management programs include equipment assets spread over a large geographical area. By using a web-based system hand help devices may take the place of a desktop computer thereby providing flexibility to when and where work orders are submitted and managed. Additionally a web CMMS software system is beneficial when many users need to at least have the potential to access the work request or repair ticket system to communicate needed repairs to the maintenance manager. Consider a large hospital maintenance department where many nurses stations and other locations containing specialized equipment need immediate access to maintenance. Another example could facility maintenance software implemented in a college or university. In this environment with the many varied and widespread equipment assets and personnel requesting maintenance a web based system is very useful. MaintSmart provides the best of both types of CMMS with the powerful reporting and analysis features of the enterprise software and the scalability and flexibility of the web CMMS software system. Could you please provide me with the pricing for your product.